That "full-on cold" I had last week has now been diagnosed as a sinus infection ... I was put on meds for it and it's improved somewhat, but not as much as I'd hoped. So it's been a week of little sleep (my coughing kept me up) and mostly staying home after work. Trying to get over being sick. My body picks up sicknesses super fast (for various reasons, which I don't feel like getting into here) and then likes to keep them for a long time. I've had this cough for almost 2 weeks now. I stayed home from work on Monday + Tuesday which I rarely do (I worked from home), if that tells you anything. Visiting Ann Arbor. Last weekend, I went to Ann Arbor to visit a friend and do dinner on the last night of Ann Arbor Restaurant Week. We went to the Gandy Dancer, which is a little bit outside of downtown, and it was excellent. It's an old train station, too (similar to Big Rock Chophouse in Birmingham, though much bigger), and the interior was very cool. 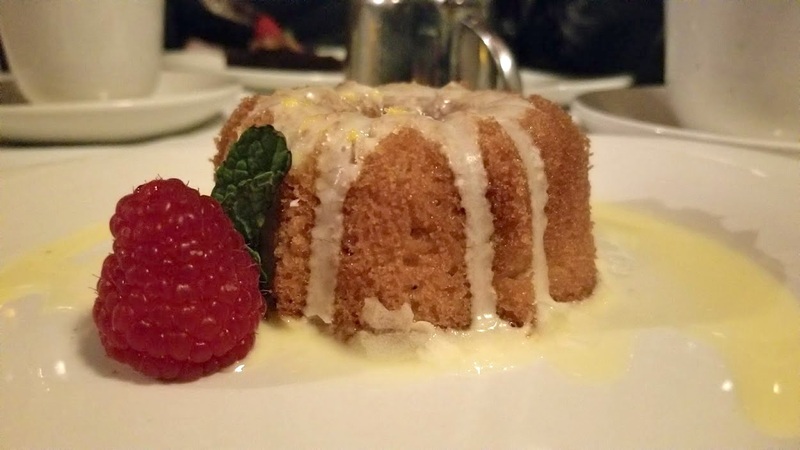 I had butternut squash soup, chicken, and the dessert pictured above (butter cake). Catching up on my DVR. Because I've been staying home all week, I've been watching a lot of TV and movies—I watched a funny movie called Fun Moms Dinner, on Netflix, which is what Bad Moms could have been, in my opinion, as well as the first Paddington. Also, does anyone here watch This is Us? This week's episode was definitely a sad one. Eating out. I probably ate out a bit too much this week, considering I wasn't exercising much. My boyfriend and I went to Blaze Pizza on Saturday, 2941 Street Food on Sunday, and Naf Naf Grill, in Troy, on Wednesday night—if you download their new app, you get a free bowl or sandwich. On Thursday, I met up with a friend for Jersey Mike's, and I also made a quick stop at Del Taco on Monday when I was waiting for medications to be filled. Planning my Indianapolis trip. Long-time readers of my blog will know that I LOVE planning trips, so I'm excited to be going to Indianapolis for a weekend in late March, for the Indiana Comic Con. We will most likely be staying at an Airbnb so I started perusing those now ... there are a lot of very affordable options in that area, which is nice.